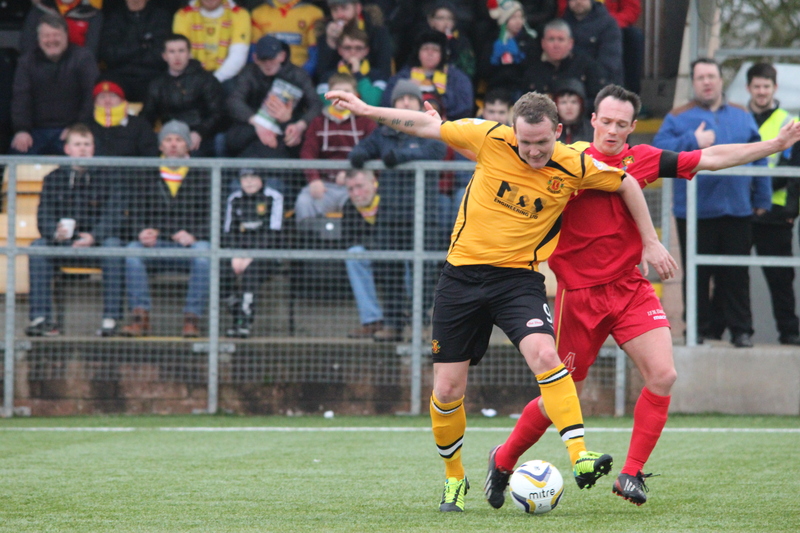 Albion Rovers lifted 3 precious league points to keep their title hopes firmly on course against an Annan team who’s fading play off hopes look even more remote following their third successive defeat. Albion won this match in the first half playing against a very strong wind and it was former Athletic favourite Ally Love who did the damage scoring 2 goals in a five minute spell mid way through the half which leaves Annans play off hopes in tatters. Annan playing with the wind started brightly with Parry saving Mitchell’s 5th minute effort, Wetherson then had a couple of efforts which did not cause any concern for the Albion defence. Jordan Hart was called into action to deal with Marc McGuigan’s effort in the 8th minute and Martin McNiff’s 20 yard effort form the edge of the box in the 16th minute flashed past the post. Albion went ahead in the 21st minute and it was a goal which caught the Annan defence square when a fine penetrating ball played from the middle found Ally Love in acres of space and he had the confidence to draw Jordan Hart and finish with a cool low shot into the corner of the net. Hart was then called into action to save Gary Fishers shot from 15 yards as Albion pressed forward to increase their lead. Albion doubled their lead in the 26th minute and once again questions were asked on the Annan defence when Mark McGuigan was allowed to pick the ball up wide on the left managing to brush aside a couple of challenges before crossing to Love who’s first effort was blocked before he made no mistake by hitting a crisp shot into the net from 8 yards. Love then had an effort chalked offside in the 33rd minute to deny him a hat trick. Annan faced an uphill task but they were creating few goal scoring opportunities to give the home fans hopes of a revival and Josh Todd latched on to a ball played from defence to home in on keeper Neil Parry who pulled off an important save but the ball broke to Omar who’s hurried shot missed the upright. Andrew Mitchell then came close with a low shot across the face of the goal as Annan increased the pressure on the Albion defence. With half time approaching Annan then pulled a contentious goal back when Peter Weatherson’s effort from close range appeared to be kicked from the line after Rabine’s effort was saved but the far side linesman adjudged the ball had cross the line . The goal gave Annan a life line but their joy was short lived when Marc McGuigan headed home at the back post from Gary Fisher’s cross sent in from the left which once again left huge question marks on Annan’s defensive capabilities as the striker rose unchallenged to head the ball into the net. Albion playing the second half with the wind in their favour were in command but the introduction of a triple substitution by Annan in the 52nd minute resulted in a transformation in Annan’s play with Albion being forced to defend deep. Despite having a large share of the ball Annan found it difficult to penetrate the well organised Albion defence marshalled by Ross and Michael Dunlop. Albion went close in the 73rd minute when Alan Reid’s effort rifled past the post and at the other end shots from Weatherson and McNiff went close. Annan continued to push forward with Albion managing to soak up everything Annan could throw at them and it was Annan who had keeper Jordan Hart to thank for when he pulled off an important save to deny substitute Chris Cadden in the 84th minute. It was an important victory for Albion after their main contenders for the title Queens Park and Arbroath recently fell at the same hurdle. Annan must now pick themselves up and somehow manage try and pick up the pieces to stop the decline into the bottom half of the league, which now sees six teams still in with a chance of the play offs and although Montrose look like the team at this stage likely to be involved in the play offs at the bottom, it is certainly not out of the question that Montrose could add to their 3-0 victory over Arbroath on Saturday and go on a run to bring the teams above them into the play off spot. ANNAN ATHLETIC: Jordan Hart, Iain Chisholm (Jack Breslin 52min), Steven Black, Martin McNiff, Peter Watson, Steven Sloan (Ryan McStay 52 min) ,Andrew Mitchell, Steven Logan (Stuart McColm 52 min) , Peter Weatherson, Josh Todd, Rabin Omar. SUBS NOT USED: Callum Cook, Chris Dickinson, Alex Mitchell Gk, Junior Ogen. ALBION ROVERS : Neil Parry, Alan Reid, Kyle Turnbull, Darren Young, Ross Dunlop, Michael Dunlop, Edward Fearns (Chris Cadden 70 min), Gary Fisher, Mark McGuigan, Ross Davidson,Ally Love ( Josh Mullin 80 min) Substitutes not used Gary Phillips, Scott Chaplain, Keiran Hughes GK, Marc McKenzie, John Gemmell.